Our Middle School Youth Formation program isstarting soon. Please don’t forget to register your child in our Encounter program for this upcoming year. The goal of Encounter is to bring our youth closer to Christ and to help them have a personal relationship with Him. 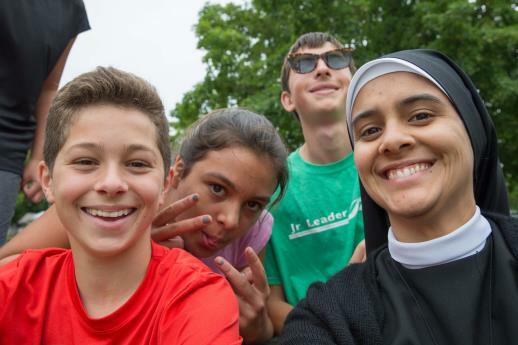 We are so excited to walk with the youth of Our Lady of Grace in their journey to become disciples of Jesus. We will have small group sessions, large group events, service projects and family events. Please remember that Confirmation preparation starts in 7th grade and is part of the Encounter YouthFormation program. Youth and parents, join us at our Kick-off Retreat on Saturday, September 23, 9:30 AM - 12:30 PM. Please contact Sr. Julieta or Sr. Eileen atpes-sisters@olgparish.org or in the Parish Office (x262) if you have any questions.